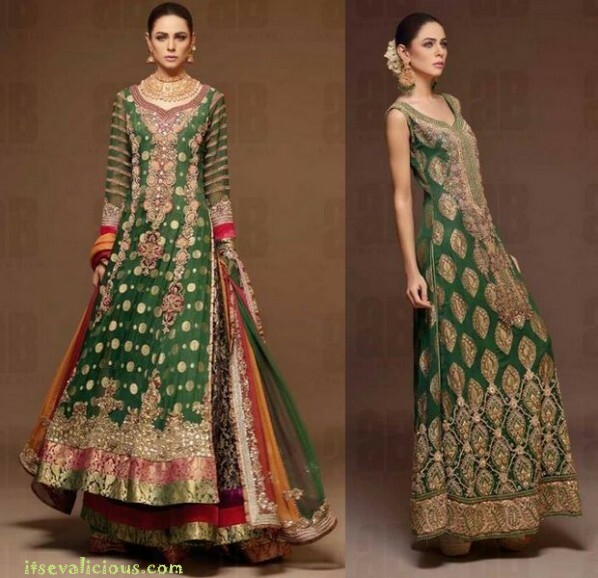 Latest Pakistani Wedding Dresses – Pakistani Bridal Dresses are drop dead gorgeous. So we have elected to create a collection of Pakistani Bridal Collection. 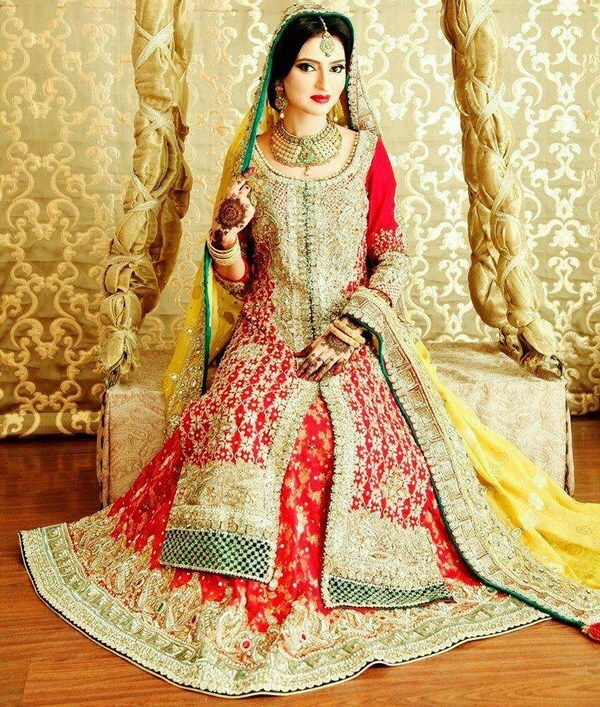 Pakistani Wedding dresses has created a lot of interest for the latest trends in India and abroad. Wedding dresses are an example of diverse traditions adopted in costumes by different cultures. Pakistani Wedding Dresses to a much higher extent resembles Indian wedding dresses due to their shared cultures before pre-Independence era. A distinct similarity has also been found between the Iranian and Turkish people. 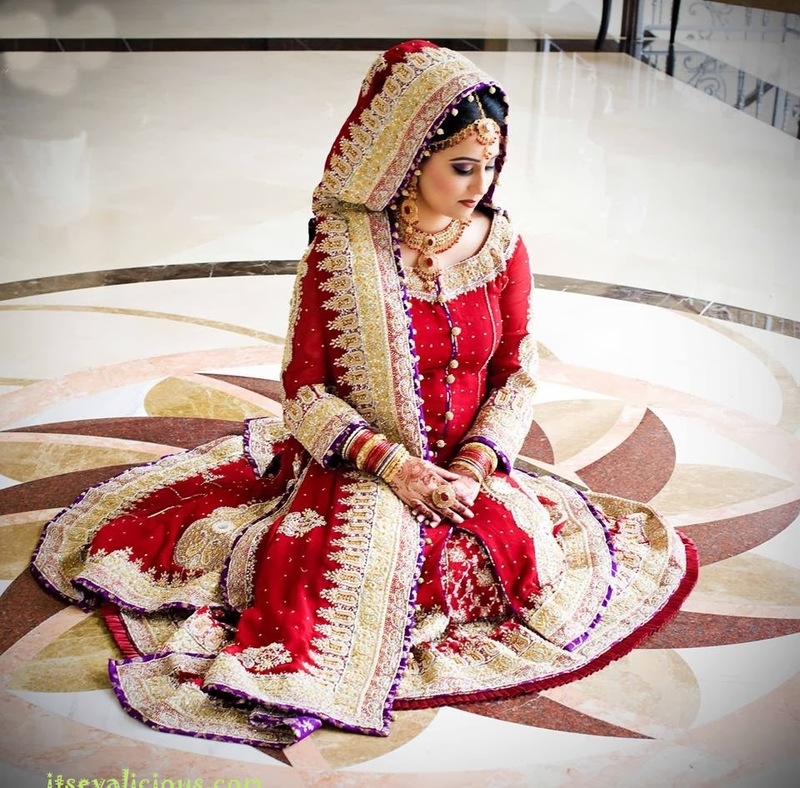 Though Pakistani dresses and Pakistani Wedding Dresses, makeup are highly adorned by Indians. The way a bride is dressed in Pakistan is exemplary. A girl definitely looks a glam diva on her special day. Wedding is an important event in every bride and grooms life. So, an exceptional and exquisite touch has been given for the dresses to make it special for the occasion. Pakistani itself has accepted various alterations from saree’s to lehenga’s as well as Salwar kameez. In most of the cases the lehenga’s would be adorned with vibrant colored stones along with gold and silver touch. The traditional color is green, yellow and red which can be selected according to the occasions that include mehndi, sangeet and wedding. However the modern trends have overcome the color confines. The Lehenga is accompanied by a long blouse with heavy embroidery on it. The whole Lehenga or Choli comes in pair with a duppatta. A long beautiful transparent dupatta is wrapped from the head to the shoulders to keep intact the sentiments of traditions. To look traditional in a Pakistani wedding dress, prefer bright and dark colors; however, you may also prefer lighter colors like mint or sky blue with lots of silver or golden embroidery. Brides can have more choice nowadays than before. They can wear a combination of cultural as well as western touch with a long gown having a indo-western touch. Farshi Pajama was an old traditional dress which has come into latest trend not only in Pakistani weddings but over major Asian countries. These pajamas are very much like Palazzo pants. A real Pakistani touch can be derived by adding these full flared pajamas with ethnic long tops. Pakistani bridal dresses embellished with jardoshi or Zari work are real representative of fashion of Pakistan. Sharara or Lehenga with motiffs of zari and jardoshi create a grand look. If you wish to go for real Pakistani designer bridal dresses then have a look at famous Pakistani designer collections. The most interesting part of Pakistani bridal dresses and outfits is they keep entire body covered. 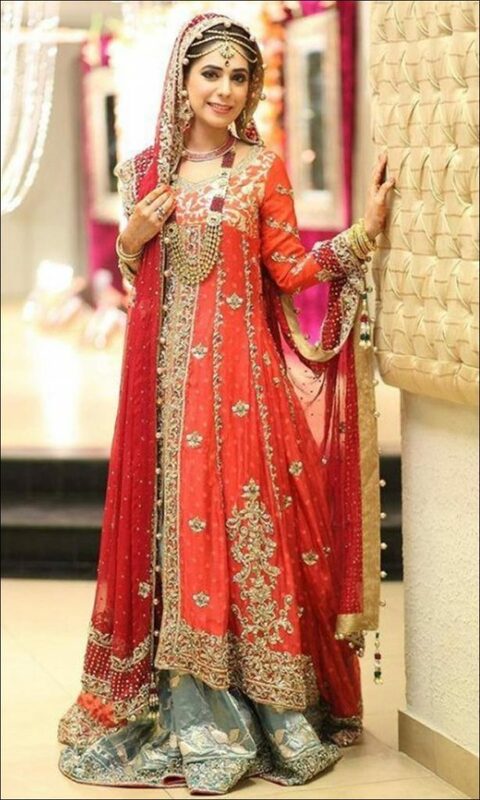 Having a rich dupatta with the dress is always a must, which shows the tender part of bridal look. In India, these collections of bridal and rich traditional dresses are going to rock the trends in Diwali. Pakistani style is trending in Indian fashion since 2014. Fashion trend of Sharara and flared pants with long kurti is denying to fade out kind of fashion. Check out Indian Bridal look images of Aishwarya Rai, who looks stunning in Indian Bridal outfits. Indian Bridal Mehndi designs for brides The latest collection. Even Pakistani marriages are savored with great food items and many functions. These receptions, Mehndi and many other functions. Walima is like reception, where friends and family gather to celebrate the occasion. Brides tend to dress in the most stylish attire during Walima functions. A Pakistani look is incomplete without ornaments and makeup. The ones used here are unique that allows you to give a typical Pakistani bride look. Heavy gold necklace- one necklace that is shorter and hugs your neck, while the other that is long and reaches your abdomen. It makes you look special and different from others. And, Veja Daman – This is a wrist ornament in the form of rings and chains through the fingers and ends up to the wrist. It is the most distinctive ornament in Pakistani wedding. Makeup is done in relation to the color of the dress. More often golden color is mixed as a common color along with red or green for makeup on eyes. Eyes are specifically darkened with a winged edge line sharply drawn forward alongside the upper eye lid and eye corners with the help of eyeliner. This is the distinctive feature of makeup in Pakistani girls. Lips are darkened with maroon or reddish color with a light pink blush on the cheeks. We have incorporated latest trends in Pakistani Bridal dresses latest collections and will be continuously updating to keep the pace with latest trends.